Streptomyces coelicolor is a bacterium with a vast repertoire of metabolic functions and complex systems of cellular development. Its genome sequence is rich in genes that encode regulatory proteins to control these processes in response to its changing environment. We wished to apply a recently published bioinformatic method for identifying novel regulatory sequence signals to gain new insights into regulation in S. coelicolor. The method involved production of position-specific weight matrices from alignments of over-represented words of DNA sequence. We generated 2497 weight matrices, each representing a candidate regulatory DNA sequence motif. We scanned the genome sequence of S. coelicolor against each of these matrices. A DNA sequence motif represented by one of the matrices was found preferentially in non-coding sequences immediately upstream of genes involved in polysaccharide degradation, including several that encode chitinases. This motif (TGGTCTAGACCA) was also found upstream of genes encoding components of the phosphoenolpyruvate phosphotransfer system (PTS). We hypothesise that this DNA sequence motif represents a regulatory element that is responsive to availability of carbon-sources. Other motifs of potential biological significance were found upstream of genes implicated in secondary metabolism (TTAGGTtAGgCTaACCTAA), sigma factors (TGACN19TGAC), DNA replication and repair (ttgtCAGTGN13TGGA), nucleotide conversions (CTACgcNCGTAG), and ArsR (TCAGN12TCAG). A motif found upstream of genes involved in chromosome replication (TGTCagtgcN7Tagg) was similar to a previously described motif found in UV-responsive promoters. We successfully applied a recently published in silico method to identify conserved sequence motifs in S. coelicolor that may be biologically significant as regulatory elements. Our data are broadly consistent with and further extend data from previously published studies. We invite experimental testing of our hypotheses in vitro and in vivo. The complete functional information encoded in a genome consists not only of the genes, encoding proteins and RNAs, but also structural and regulatory elements. Complete genome sequences are generated much faster than regulatory sites can be determined by experiment, and so there is a need for computational prediction and detection of regulatory elements in complete genomes. In some cases, a set of co-regulated genes (i.e. a regulon) is known, for example as the result of micro-array experiments. Several algorithms are available to discover sequence motifs that occur more frequently in a set of co-regulated genes compared against the background sequence [e.g. [1–6]]. In the absence of experimental evidence for co-regulation, an alternative approach is to compare the upstream regions of orthologous genes from different species [7–9]. Successful as these procedures have been, they also have limitations. For example, mRNA micro-array experiments will only find those regulons that are responsive to the laboratory conditions tested, and interspecies comparison is limited by the availability of species separated by an appropriate phylogenetic distance. Several recent studies have addressed the problem of discovering binding sites for regulatory proteins in the absence of experimental data about co-regulation [e.g. [10, 11]]. Again these methods are based on identifying short DNA sequences that occur more frequently in a subset of sequences than would be expected from a random sample of the background distribution. Li et al. carried out a comprehensive analysis of the complete Escherichia coli K12 genome sequence and discovered many new potential regulatory elements as well as recovering previously known binding sites for 37 regulatory proteins. Subsequently, Mwangi and Siggia  applied the same technique, with some refinements, to the complete genome of the Gram-positive bacterium Bacillus subtilis. Streptomyces species are Gram-positive soil bacteria that undergo a complex cycle of morphological differentiation, which culminates in the spore-bearing aerial hyphae on mycelial colonies. This process of morphological differentiation is also accompanied by physiological differentiation, characterised by production of biologically active secondary metabolites. In fact Streptomyces species produce the majority of known antibiotics . The huge metabolic repertoire and complex developmental cycle is the product of one of the largest known prokaryotic genomes. The genetically best-known representative of the genus, S. coelicolor A3(2), possesses an 8.67 Mb linear chromosome . Its complex genome is particularly rich in regulatory proteins (12.3% from 7825 predicted genes) including about 65 sigma factors . We applied a similar method to that of Li et al. and Mwangi and Siggia  to try to discover novel regulatory motifs in Streptomyces coelicolor. The non-coding intergenic regions of the S. coelicolor genome were scanned for significantly over-represented dyads of the form W1NxW2 (see Methods for more details) where W1 and W2 each represent a sequence of 4 nucleotides and Nx represents a sequence of between 4 and 20 nucleotides long. This resulted in identification of 2770 dyads that were statistically over-represented. These are listed in additional file 10 [significantly_overrepresented_dyads.txt]. The 2770 dyads were grouped into 2497 clusters, each of which was used to generate a position-specific weighted scoring matrix (PSWM). Essentially, each PSWM represented a statistical model of a DNA sequence motif, which summarises the relative frequencies of each of the four nucleotides at each position. Each of the matrices is listed in additional file 11 [matrices.txt]. All the intergenic sequences in the S. coelicolor genome were scanned against each of the matrices to find high-scoring matches to the DNA sequence motifs represented by each matrix. Thus we identified 2497 sets of genes that share common upstream DNA sequence motifs. Given this large quantity of data, the challenge was to determine which of these sets of genes sharing common upstream sequence motifs represented biologically significant regulons. One way to address this issue was to search the data for sets of genes that are functionally coherent; that is to find those sets of genes in which the number of members associated with a particular biological function is significantly larger than that which could be explained by chance. As an indicator of biological function, we made use of a protein classification scheme  (see additional file 12 [classification_scheme.txt]) based on that originally created for E. coli in the EcoCyc database [16, 17]. For every set of genes sharing an upstream DNA sequence motif, each gene was assigned to one of the 181 functional classes. To determine whether any functional class was statistically significantly over-represented in the set of genes, a P value was calculated. The P value represented the probability of obtaining the observed number of genes (or more) belonging to that functional class within a set. This P value indicates the statistical significance of functional coherence within a set of genes. We chose a threshold P value that was equal to one divided by the product of the number of matrices and the number of categories considered: 1 / (2497 *181) = 2.21 × 10-6. Thus by chance alone for the complete analysis, we would expect to find less than one set of genes in which the P value is less than this threshold. In fact, we found 11 sets of genes sharing common upstream sequence motifs that contained over-represented functional categories (Table 1 and Figure 2) plus several additional motifs associated with category 5.1.4 "Transposon/insertion element-related functions". The motifs associated with category 5.1.4 were excluded from further consideration as the aim of this study was to identify potential regulatory elements, not repeats associated with mobile elements. Table 1. Position-specific weight matrices (PSWMs) that represent DNA sequence motifs shared by functionally coherent sets of genes in Streptomyces coelicolor. A library of 2497 matrices was generated from alignments of over-represented DNA sequence dyads as described in the Methods section. Each matrix is essentially a statistical model of a DNA sequence motif . The non-coding regions of the S. coelicolor genome were searced against the matrices to find matches to each of the sequence motifs. The scanning method assigneda score (maximum 100) to each match site. The minimum score threshold was chosen as 80. For each matrix, we recorded the number of genes whose upstream region contains at least one match site. We also recorded the number of those genes belonging to each functional category in the protein classification scheme, and calculated a P value to determine whether that functional category was significantly over-represented. We performed a negative control experiment whereby we randomly shuffled the orders of the columns of each of the 2497 matrices and repeated the scans. After excluding several motifs associated with category 5.1.4 "Transposon/insertion element-related functions", none of the matrices yielded sets of target genes that satisfied the criteria for functional coherence. It is important to note that for a set of genes to be functionally coherent, it is not necessary that the majority of members of the set belong to a particular category; it is only necessary that the number of members belonging to a particular functional class is greater than could be reasonably expected by chance. One of the matrices (matrix 2083), when used to search against the S. coelicolor genome, yielded matches upstream of sets of genes in which the functional class 2.1.3 "Degradation of polysaccharides" were over-represented (Table 2, additional file 1 [table2.pdf]). Many of the sites were also conserved in the close relative S. avermitilis (Table 10, additional file 9 [table10.pdf]). Scanning the genome sequence of S. coelicolor against matrix 2083 yielded intergenic match sites upstream of 54 genes, including nine that encode chitinases (SCO1429, SCO2503, SCO5003, SCO5376, SCO5673, SCO5954, SCO6012, SCO7225 and SCO7263) and two that encode chitin-binding proteins (SCO0481 and SCO2833). The intergenic regions upstream of SCO2503, SCO6012, SCO7225 and SCO7263 each contain two sites (i.e. tandem repeats). Chitinases (EC 3.2.1.14) are a group of glycosylhydrolases that hydrolyse chitin, a polymer of N-acetylglucosamine linked by beta-1, 4-bonds. Streptomycetes are the main decomposers of chitin, the second most abundant polysaccharide in soil. The complete genome of S. coelicolor  encodes 11 chitinases . Several studies have demonstrated that Streptomyces chitinase genes are induced in the presence of chitin and repressed in the presence of glucose plus chitin [19–22]. A direct repeat of the sequence TGGTCCAGACCT, similar to that of our motif, was shown  to be involved in the both chitin-induction and in glucose-repression of chi63 encoding chitinase C (SCO5376). A similar motif has been identified upstream of several other chitinases in S. coelicolor [23–25]. From the results of our searches against matrix 2083, it was apparent that several genes had direct repeats of the motif in their upstream non-coding regions. These included genes encoding chitinases (SCO2503, SCO6012, SCO7225 and SCO7263), phosphoenolpyruvate phosphotransfer transport system (PTS) components (SCO2907 and SCO5841), a hydrolase (SCO6032), amongst others (Table 2, additional file 1 [table2.pdf]). The distance between repeated instances of the motif appeared to be quite variable. The identity of the transcription factor(s) mediating regulation of chi63 through this DNA element is not known. In S. lividans, glucose repression of chitinase production involves glucose kinase (encoded by glkA) [26, 27]. However, it has been demonstrated that glkA is not required for glucose repression of chi63 in S. coelicolor . In S. lividans, regulation of chitinases also requires Reg1, the 345-amino acid product of the gene reg1 [29, 30]. Reg1 (SwissProt P72469) is a member of the LacI/GalR family of transcriptional regulators and contains a helix-turn-helix motif at its N terminus. Reg1 is 95% identical to MalR, the repressor of malE in S. coelicolor, and reg1 shares synteny with malR; so Reg1 can be considered to be the orthologue of MalR . Two Reg1 (MalR) binding sites upstream of malE have been identified in S. lividans by DNA footprinting . These operator sequences share no obvious similarity with the motif represented by matrix 2083. Therefore it is unlikely that this motif represents the Reg1/MalR binding signal. Interestingly, the intergenic sites matched by matrix 2083 also included several that are upstream of genes encoding components of the PTS. The main function of the PTS is to carry out the fundamental process of substrate-level phosphorylation, whereby the transport and activation of sugar substrates are thermodynamically coupled to dephosphorylation of the glycolytic intermediate phosphoenolpyruvate. The phosphoryl relay proceeds sequentially from phosphoenolpyruvate to enzyme I (EI), HPr, enzyme II (EII), and finally to the incoming sugar that is transported across the membrane and concomitantly phosphorylated by EII. Additionally, in Gram-negative and low G+C Gram-positive bacteria, PTS components have been shown to participate in signal transduction, chemotaxis, and the regulation of some key physiological processes, e.g., carbohydrate transport, catabolite repression, carbon storage, and coordination of carbon and nitrogen metabolism [32, 33]. Complete genome sequencing confirmed the presence of the general PTS components enzyme I (ptsI), HPr (ptsH) and enzyme IIACrr (crr) in S. coelicolor [14, 34–37]. Also there are several genes that may encode four sugar-specific PTS permeases. Several studies have examined the PTS in Streptomyces species and demonstrated its activity [e.g. [34–38]]. Sites matching matrix 2083 were found immediately upstream of several S. coelicolor genes that encode PTS EII components (SCO1390, SCO2906 and SCO2907) and ptsH (SCO5841) that encodes HPr. The co-occurrence of similar DNA elements upstream of genes encoding glucose-repressible chitinases and upstream of PTS genes, suggests that a regulatory mechanism may be common to both sets of genes. More specifically, an unidentified transcription factor that is presumed to mediate chitin-induction and glucose repression of chi63 may also play a role in regulation of the PTS in S. coelicolor. In addition to those associated with chitinases and PTS components, a number of other sites matching matrix 2083 (Table 2, additional file 1 [table2.pdf]) were also found upstream of genes involved in carbohydrate metabolism, including acetyl-coenzyme A synthetase (SCO3563), a putative glucosamine phosphate isomerase (SCO5236) and several putative sugar binding proteins (SCO0531, SCO2946 and SCO5232). It seems plausible that these might also share a common regulatory system with the PTS and chitinases. Of the 21 ORFs having an upstream match to matrix 2318, six belong to functional category 2.2.3 "DNA – replication, repair, restriction/modification" (Table 3, additional file 2 [table3.pdf]). These included genes predicted to encode an ABC excision nuclease (SCO1966), DNA helicase (SCO5761), DNA polymerase (SCO3541 and SCO6084), a DNA gyrase (SCO5836) and a putative primosomal protein (SCO1475). A sequence motif represented by matrix 1744 was found in intergenic regions upstream of three genes classified as belonging to category 1.2.1 "Chromosome replication" (Table 4, additional file 3 [table4.pdf]). The genes encode a putative replicative DNA helicase (SCO3911), a DNA polymerase subunit (SCO2064) and recombinase RecA (SCO5769). Matches also occurred upstream of other genes implicated in nucleic acid metabolism including ABC excision nuclease subunits (SCO1953, SCO1958 and SCO1966), a helicase (SCO6262) and uracil-DNA glycosylase (SCO1343). On further examination of the matrix 1744 match site upstream of S. coelicolor recA, it became apparent that this site overlaps the previously described recA promoter . The recA promoters of Streptomyces and Mycobacterium species represent a distinct class of promoter whose consensus sequence is TTGTCAGTGGCN6TAGggT, and which are probably responsive to ultra-violet (UV) light . Clearly the motif represented by matrix 1744 (TGTCagtgcN7TAgg) is related to this promoter sequence consensus. Bacterial sigma (σ) factors confer upon RNA polymerase the ability to recognise promoter sequences. Streptomyces coelicolor encodes about 65 sigma factors, each perhaps having different promoter-specificities. One important family of sigma factors are the extracytoplasmic function (ECF) sigma factors, of which S. coelicolor encodes about 50 . We found matches to matrix 46 in intergenic regions upstream of 116 genes. Of the 66 S. coelicolor genes belonging to class 6.2.1 "Sigma factor", ten had matches to matrix 46 in their upstream intergenic regions (SCO0038, SCO0803, SCO2742, SCO3356, SCO4960, SCO7104, SCO7105, SCO7112, SCO7192 and SCO5216). A match was also found upstream of SCO5216, annotated as a sigma factor (Table 5, additional file 4 [table5.pdf]). All eleven of these gene products are predicted to belong to the ECF family of sigma factors, though SCO0038 is only fragment, not a complete sequence. 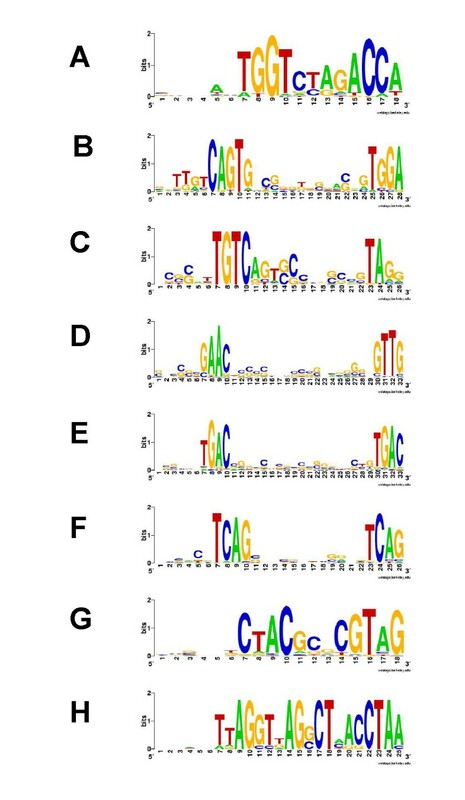 It is possible that this motif, TGACN19TGAC, may be involved in some hitherto unknown mechanism of regulation shared by several ECF sigma factors in S. coelicolor. Matrix 1909 matched 106 intergenic sites, 22 of which were upstream of genes belonging to functional class 4.1.7 "Gram positive exported / lipoprotein" (Table 6, additional file 5 [table6.pdf]). The putative products of these 22 genes included many proteins of unknown function predicted to be secreted across the cell membrane (e.g. SCO2741, SCO2001 and SCO1650). Also this GAACN19GTTG motif was found upstream of genes for six secreted peptidases. According to the MEROPS classification , these belong to peptidase family S8 (SCO0432, SCO1741), family M1 (SCO7605), family M6 (SCO2920), family M16 (SCO5837) and family M23 (SCO3368). 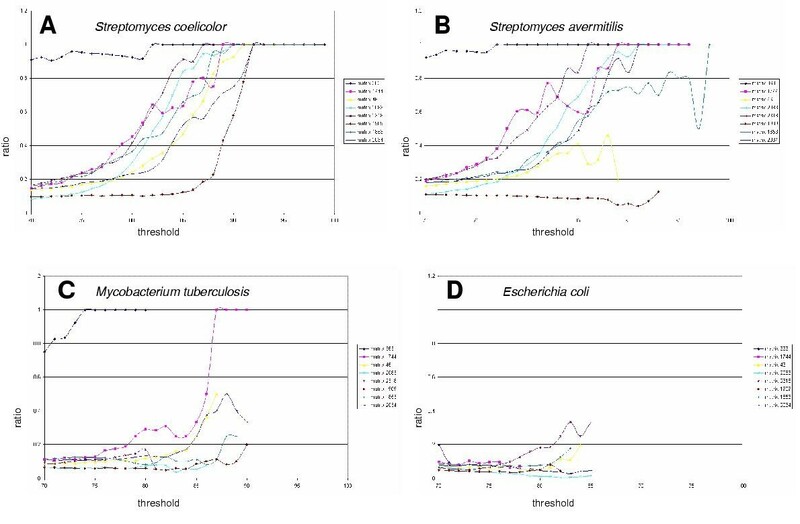 A homologue of SCO0432 (38% sequence identity) cloned and purified from S. albogriseolus has been shown to be secreted and to have subtilisin-like endopeptidase activity . Sigma factors belonging to the ECF family characteristically recognise an 'AAC' motif in the -35 region . We hypothesise that this GAACN19GTTG motif may represent a class of promoters targeted by an as yet unidentified ECF sigma factor that regulates expression of some or all of these extracellular proteins. Members of the ArsR family are metalloregulatory transcriptional repressors, which repress expression of operons involved in response to high concentrations of heavy metal ions . Binding of metal ions to the ArsR protein leads to derepression of the target operons. For example, an ArsR-homologue, SrnR, was shown to mediate nickel-responsive transcriptional repression of superoxide dismutase in S. griseus . Fifteen genes in S. coelicolor are predicted to encode ArsR-like transcriptional regulators . Of these fifteen, four (SCO0875, SCO3699, SCO6808, and SCO6836) have an upstream match to the motif TCAGN12TCAG, represented by matrix 2034 (Table 7, additional file 6 [table6.pdf]). In fact SCO6836 has two upstream matches and SCO3699 has three upstream matches. It is possible that this motif represents a regulatory element. None of the other genes with upstream matches are obviously implicated in metal ion stress, so it is unlikely that this is a motif associated generally with metal ion stress response. Also, these matches are not conserved upstream of ArsR homologues in S. avermitilis. The genome of S. coelicolor encodes 25 proteins belonging to category 3.3.11 "Nucleotide interconversions" (Table 8, additional file 7 [table8.pdf]). In the upstream intergenic regions of five of these, there are matches to the near-palindromic motif CTACgcNCGTAG represented by matrix 1853 (SCO1776, SCO2015, SCO4901, SCO4914 and SCO4917). Furthermore, a match is found upstream of SCO4886. SCO4886 may be the first gene in an operon also containing SCO4889, which encodes a putative cytidine deaminase. A match is also found upstream of SCO4152, encoding a secreted nucleotidase and thiC (SCO3938), which is involved in biosynthesis of the nucleotide-derived cofactor thiamine. In many other bacteria, including the Gram-positive Bacillus subtilis and Mycobacterium tuberculosis, immediately upstream of thiC is a highly conserved motif called the thi box , which is characteristic of the so-called TPP riboswitch . However, according to the Rfam database , there is no recognisable TPP riboswitch in the vicinity of thiC in S. coelicolor. This motif seems to be a good candidate regulatory element and it would be intriguing to test whether it is involved in regulation of nucleotide metabolism and possibly associated secondary metabolic pathways. Actinomycetes are famous as producers of antibiotics and other useful products for biotechnology . In the S. coelicolor genome, the products of 165 genes were classified as belonging to category 3.8.0 "Secondary metabolism" (Table 9, additional file 8 [table9.pdf]). Three matches to the near-palindrome TTAGGTtAGgCTaACCTAA occur in intergenic regions within a cluster of these genes. This motif was represented by several related matrices (363, 571, 293 and 153). One match falls between the divergently transcribed SCO0489 and SCO0490, the second falls between the divergently transcribed SCO0498 and SCO0499, and the third falls upstream of SCO0495. It seems plausible that this motif may be involved in coordinated regulation some or all of the genes in this cluster. Their precise function of is unknown, but since these enzyme-encoding genes are clustered together on the chromosome it is possible that they may encode components of a single metabolic pathway. An additional incidence of the motif occurs upstream of a further gene implicated in secondary metabolism (SCO2782). A biologically significant regulatory sequence motif would be expected to occur more frequently in non-coding rather than coding regions of a bacterial genome sequence. Therefore, we investigated whether there was such a bias in the distribution of matches to each matrix in the complete genome of S. coelicolor (Figure 1A). We scanned the complete genome sequence of S. coelicolor against the matrix using a range of different threshold scores. For each threshold used, we counted the number of matches occurring in intergenic regions and those occurring within coding regions, and calculated the ratio between the two counts. About 5% of the S. coelicolor genome is predicted to be non-coding . When low threshold scores were used, for most matrices about 10% of the matches fell within intergenic regions. However, when the searches were made more stringent by raising the threshold, the ratio clearly changed and there was a clear bias towards non-coding regions such that using a threshold of 90, over half the matches occur in the 5% of the S. coelicolor genome that is non-coding. The distribution of matches to matrix 363 was exceptionally biased towards non-coding regions, with about 90% of the matches occurring in non-coding DNA even when the threshold was lowered to 70. Occurrence of sequence motifs in coding and non-coding DNA. The genomes of Streptomyces coelicolor (A), S. avermitilis (B), Mycobacterium tuberculosis (C) and Escherichia coli (D) were scanned against each matrix to find matches to the corresponding DNA sequence motifs. The scanning method assigned a score (maximum 100) to each match site. Scans were performed using a range of different threshold minimum scores. For each threshold, we counted the number of match sites (with a score of equal to or greater than the threshold) found in coding and in non-coding DNA (i.e. intragenic and intergenic sites respectively). The ratio of the number of intergenic sites to the number of intragenic sites is plotted for each threshold level that was used. The matrices are further described in Table 1. Consensus sequences as indicated from Table 1. A similar pattern was observed when the analysis was repeated using the closely related S. avermitilis genome  (Figure 1B) for most of the matrices. However, the bias was much smaller for matrix 46, and apparently absent for matrix 1909. This suggested that these motifs are probably not biologically significant in S. avermitilis. If matrix 1909 does indeed represent a recognition site for an ECF sigma factor as suggested above, then presumably the sigma factor is not conserved in S. avermitilis. When the same matrices were used to scan the genome of the more distantly related Mycobacterium tuberculosis  (Figure 1C), the bias towards non-coding DNA was much less pronounced. However, matches to matrix 363 and matrix 1744 showed a significant bias towards non-coding DNA in M. tuberculosis as well as in Streptomyces species, suggesting that they might be biologically significant in a broader range of organisms. Consistent with this observation, it has previously been reported that the UV-responsive promoter motif represented by matrix 1744 is conserved in mycobacteria as well as streptomycetes . In the genome of the very distantly related E. coli , there was little or no detectable bias towards occurrence in non-coding DNA (Figure 1D). Historically, the study of regulation in Streptomyces species has focussed on antibiotic production and cellular differentiation and relatively few regulons have been confirmed. We successfully applied a bioinformatic technique [11, 12], which had been developed using the model bacteria E. coli and B. subtilis, to identify conserved DNA motifs in the actinomycete S. coelicolor. This resulted in a large number of sets of genes sharing common upstream DNA sequence motifs. These sets could be considered as 'putative regulons', but it is likely that many or most of the motifs would not in fact be biologically significant. Therefore, we selected a small subset of the 'putative regulons' that were functionally coherent (Table 1 and and Figure 2), and therefore might genuinely represent sets of genes that share regulatory DNA elements in common. One of the functionally coherent putative regulons included genes encoding PTS components, chitinases and other carbohydrate degradation and transport functions. Members of this putative regulon shared an upstream sequence motif (TGGTCTAGACCA). Since the roles of glucose kinase and Reg1 on chitinase regulation are indirect, the mechanism of regulation of S. coelicolor chitinases remains unknown. The presence of a sequence motif that is shared by several chitinases and other genes of carbohydrate metabolism is intriguing. One possibility is that the shared sequence motif represents the target site for a DNA-binding transcription factor. A candidate regulatory factor is ChiR , which has been shown to be involved in activation of chiC expression in S. coelicolor. ChiR belongs to the two-component response regulator family  and contains a good candidate DNA-binding domain. However, the target DNA sequence for ChiR is unknown, as no direct DNA-binding has yet been demonstrated . We discovered a motif found upstream of genes involved in replication (Table 4, additional file 3 table4.pdf]), which was similar to that of a previously described class of UV-inducible promoters . Also we found conserved sequence motifs associated with ECF sigma factors, ArsR-like transcriptional regulators, nucleotide metabolism, and secondary metabolism. We hope that these in silico predictions will provide a useful starting point for future experimental work (such as micro-array studies) on important regulatory systems in Streptomyces. Sequence data were downloaded from the NCBI FTP site . A series of Perl scripts were developed to implement a similar method to that described by Li et al. for identification of potential regulatory signals in intergenic regions of complete genome sequences. These scripts are included in additional file 13 [scripts.tar] and can also be freely downloaded from the corresponding author's website . The identification of potential regulatory motifs within a given genome consisted of several steps. First, the script 'get_significant_dyads.pl' (see additional file 13 [scripts.tar]) was used to find statistically over-represented dimers or 'dyads'. Secondly, the significantly over-represented dyads were grouped into clusters of dyads sharing high sequence similarity (using script 'cluster_dyads.pl'). Next, for each cluster, the script 'find_matches.pl' extracted short sequence strings that matched the dyads in that cluster. Then for each cluster, the associated set of sequence matches was aligned using ClustalW . Finally each alignment was converted into a position-specific weight matrix (using script 'make_matrix.pl'), which was used to search the genome sequence for close matches. Each step is described in more detail below. A dyad is a DNA sequence of the form W1NxW2; that is two words, W1 and W2, separated by x residues. The pair of conserved oligonucleotides correspond to residues that enter into direct contact with the DNA-binding domain of the transcription factor. Their pairing is due to the fact that many bacterial transcription factors form dimers, with each unit binding to a similar small element, accounting for the symmetry of the site [4, 11, 12]. where y(D) is the expected number of occurrences of the dyad D under the null hypothesis that the occurrences of W1 and W2 are uncorrelated. The dyad was considered to be significantly over-represented if it had a P value of less than the inverse of the number of dyads considered [10–12]. Thus we would expect less than one of the 'significantly over-represented dyads' to have been included by chance. In identifying significantly over-represented dyads, we only considered non-coding DNA less than 300 bp upstream of a predicted translational start codon. This upper limit was chosen because it almost all known regulatory sites in bacteria fall within 300 bp of the coding region . Many of the over-represented dyads represented different but overlapping versions of the underlying sequence motif [10–12]. To cluster the dimers, a pairwise similarity score was computed for each aligned pair of dyads D1 and D2 using the same method as [10–12]. Each dyad was considered as a vertex in a graph object. For each pair of dyads, D1 and D2, if the pairwise score was greater than or equal to a threshold of 7, an edge was added to the graph to connect D1 and D2. This procedure led to a graph object comprising a forest of a few large trees. Some rather dissimilar dyads were linked to each other via a series of several edges; therefore, the trees needed to be pruned to generate a larger number of compact trees that contained only a few closely related dyads. The process of pruning consisted of removing any edges linking pairs of dyads whose pairwise score was below a threshold of 5.
where i is the position within the site, p b is the frequency of that base in the genome, and f b,i is the observed frequency of each base at that position (from the matrix). To avoid taking the logarithm of zero, a 'pseudocount' was used such that where f b,i was equal to zero, the value of was taken as zero. Values for p b were calculated from the percentage G+C content of the genome sequence. Scores were normalised such that 100 is the highest possible score for a sequence window. DJS is supported by the MRC and is also grateful to Alex Bateman and Sam Griffiths-Jones for useful discussions. DJS conceived of the study, wrote the Perl scripts, carried out the bioinformatic analysis, and wrote the manuscript. SDB and JK also contributed to interpretation of the data and writing the manuscript.